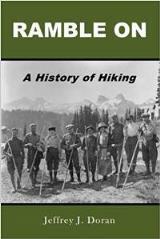 We really appreciate you supporting our sponsors, which helps to keep this blog and the HikingintheSmokys.com website up and running. Finally, if you need any help on where to hike this fall, check out our fall hiking page for the best hikes throughout the autumn period. Great Smoky Mountains National Park officials announced that the Clingmans Dome Observation Tower will be closed beginning today, August 23rd, through the remainder of the 2017 season to complete rehabilitation work thanks to funding received from a Partners in Preservation (PIP) grant. The $250,000 grant was awarded last summer to the Friends of the Smokies on behalf of the park after being one of the top nine, most voted for parks in the Partners in Preservation: National Parks Campaign in 2016. Straddling the North Carolina and Tennessee state line at 6,643 feet, the tower is a prominent landmark and destination as the highest point in the park. The rehabilitation work will consist of repairing the worst deteriorated areas on the concrete columns and walls, stabilizing support walls at the base of the ramp, and repointing some stone masonry. To accomplish this work in a timely manner and for the safety of our visitors the tower will be closed for the duration of the project. While visitors will not be able to climb the tower for views out over the surrounding tree tops, the Clingmans Dome parking overlook will be open and offers outstanding mountain top views. The visitor contact station and store, the trail to the tower, and all access to the trailheads in the vicinity will remain open, including the trail to Andrews Bald. Visitors should expect some construction traffic in the vicinity of the contact station and along the trail. The observation tower is a precedent-setting design of the National Park Service’s Mission 66 program, which transformed park planning, management, and architecture and fundamentally altered the visitor experience in national parks. Since 1959, millions of visitors have climbed the tower, where they can see distances of up to 100 miles over the surrounding mountains and valleys. Some minimal preservation work today on the tower will ensure that visitors continue to experience this unique structure spiraling up from the highest point in the park. 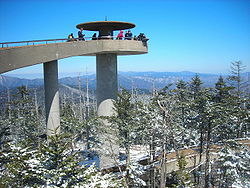 For more information about the Clingmans Dome Tower, please visit he park website at https://www.nps.gov/grsm/planyourvisit/clingmansdome.htm. This Wednesday, August 23rd, is the 23nd annual Friends Across the Mountains Telethon. The event will again be broadcasted on WBIR-TV Channel 10 in Knoxville, TN and WLOS-TV Channel 13 in Asheville, NC from 7:00 PM - 8:00 PM. The broadcast will highlight projects and programs that Friends of the Smokies has funded over the years. It's a fun event that raises awareness of both the Park's needs (as the only major national park without an entrance fee), and the ways that Friends of the Smokies helps to fulfill some of those needs every year. The telethon raises roughly $200,000 each year, and has raised more than $3.5 million dollars over the last 20+ years. Great Smoky Mountains National Park officials are urging visitors to review the Frequently Asked Questions information posted on the park’s 2017 Solar Eclipse website at https://www.nps.gov/grsm/planyourvisit/2017-solar-eclipse.htm to assist in planning a safe solar eclipse experience. Everyone is reminded to use only approved solar eclipse glasses when directly viewing the eclipse. Glasses can only be removed during the brief few seconds when in the area of totality. The duration of totality varies greatly across the park and region. A common cause of eye injury during a total eclipse is immediately following totality when viewers forget to put their glasses back on. Visitors should bring plenty of food and water and make sure their vehicle has a full tank of gas before entering the park. The high amount of traffic expected will cause difficulties for towing companies to reach vehicles in need. The traffic could also cause temporary road closures throughout the day as the park manages the influx of vehicles entering the park. Anyone planning to travel to or through the park should have an alternate route in mind in case the first path or viewing location is no longer available. Visitors are asked to remember to respect the park and it’s wildlife by staying at least 50 yards from bears and elk and not feeding any park animals. Trash should be packed out or put in an appropriate trash receptacle to keep our overlooks and viewing areas clean. Backcountry hikers are reminded to follow Leave No Trace principles and to make sure they are prepared for the distance and mountainous terrain of their planned hike. Visitors should also remember that Clingmans Dome Road will be closed to public access beginning at 11:00 p.m. on Saturday, August 19 through the evening of Monday, August 21 following the eclipse event. No overnight parking will be allowed at Clingmans Dome Parking Area or pull-offs, parking areas, and trailheads along the road during this time period. The road will be closed to all motorists, pedestrians, and bicyclists. The Clingmans Dome Trail will be open to the public, but the tower will be accessible to media only. The event at Clingmans Dome will be livestreamed at https://livestream.com/accounts/7167144/solareclipse2017-GreatSmokyMountains. In celebration of the organization’s 25th anniversary next year, Friends of the Smokies is delighted to announce a milestone capital campaign to fund a critical radio system upgrade in Great Smoky Mountains National Park (GSMNP). The radio communications system currently used in GSMNP has exceeded its recommended maximum lifespan. Replacement parts are difficult to come by and repairs and maintenance are costly on a tightening federal budget. The proposed project will replace microwave and repeater equipment at nine radio tower sites around the park as well as portable radio units and mobile units in patrol vehicles and fire engines. This will allow park rangers and emergency dispatch to directly communicate with police, fire, and emergency services in jurisdictions outside park boundaries including agencies in North Carolina and Tennessee. The total cost of the upgrade also includes a Computer Aided Dispatch system which allows dispatchers to prioritize and record emergency calls and locate first responders in the field. In addition to improving emergency response for law enforcement, search and rescue, and wildland fire, this upgrade will provide operable and dependable equipment for day-to-day operations across more than 522,000 acres of the national park. Where before, facility maintenance might share the same channel with an active search and rescue operation, the upgraded communication system will provide dedicated emergency frequencies. Friends of the Smokies has contributed millions of dollars towards milestone projects including matching $2 million from the Aslan Foundation of Knoxville in 2008 to create the Trails Forever endowment. Now grown to more the $5 million, this endowment funds a full-time trail crew that focuses on rehabilitation of the park’s most heavily used trails, including Chimney Tops, Alum Cave, and Rainbow Falls. Recurring support from Friends of the Smokies to GSMNP for programs like environmental education, historic preservation, and wildlife management exceeds $1 million annually. To make a matching gift to support this critical radio system upgrade, please visit Donate.FriendsOfTheSmokies.org or call 800-845-5665. •Expect heavy traffic. Have plenty of patience and make sure you have full tank of gas. Rangers may implement short term closures if parking becomes full or roads become congested. •Plan several options for viewing locations and get there early. If parking is full at your first choice location, move to another. •Be prepared. In addition to special viewing glasses, visitors should bring food, plenty of water, a first-aid kit, flashlight, and provisions for changing weather. •Pack it in, pack it out. To help protect park resources, visitors should pack out any trash generated during their time on the Parkway. Shenandoah National Park will celebrate the importance of dark skies and the beautiful night skies that Shenandoah protects with the second-annual Night Sky Festival from Friday, August 18 to Monday, August 21. Join Park Rangers, special speakers, and local volunteer astronomers during four exciting days of talks, walks, audio-visual presentations, and sky viewing throughout the Park. The event will culminate with a viewing of the solar eclipse on Monday, August 21. Shenandoah and other national parks provide excellent opportunities to experience starry night skies and natural darkness. Join us to learn the basics of astronomy, discover the importance of protecting dark night skies, enjoy some close up views of stars and planets, and learn about eclipses. On August 21, 2017, the final day of the festival, the 2017 Solar Eclipse will cross the continental United States. While Shenandoah National Park will only experience 80-85% coverage of the sun at approximately 2:40 p.m., and will not experience a total eclipse, it is still a great place to learn about and experience an eclipse. Join Rangers throughout the weekend and on the day of the eclipse to learn why a solar eclipse happens, what to expect, and how to view it safely. Activities will take place in a variety of locations throughout the Park. For a complete list of the weekend’s events, see the Night Sky Festival schedule. All programs are free. There is a $25-per-vehicle entrance fee to the Park which is good for seven days. Participants are encouraged to dress for cool mountain nights during evening activities and bring blankets, chairs, and flashlights for stargazing. Night sky viewing may be canceled depending on cloud cover or inclement weather. Shenandoah National Park managers will temporarily close the area surrounding Corbin Cabin (see closure map, red rectangle) to all hiking and backcountry use during helicopter operations associated with the restoration of the historic cabin. Since the cabin is located in a remote area, a helicopter will be used to remove construction materials related to the project. The temporary closure will be in effect from 6:00 a.m. August 8 through 6:00 p.m. August 11. The closure area is located southeast of Skyline Drive (mileposts 37 and 38) in the vicinity of the upper Nicholson Hollow/ Corbin Cabin Cutoff Trail. Trails closed include all of the Corbin Cabin Cutoff Trail and the Nicholson Hollow Trail from the intersection of the Indian Run Trail eastward to 1/4 mile east of the Corbin Cabin. There will be no closures on Skyline Drive or the Appalachian Trail. As soon as the project is completed, the temporary closure will be lifted. The National Park Service Investigative Services Branch (ISB) is investigating a hit and run accident that occurred at approximately 8:15 p.m. on Saturday, July 29 along Little River Road in Great Smoky Mountains National Park. A motorcyclist fled the scene after striking and seriously injuring a 13-year old, female pedestrian at a pulloff between the Townsend Wye and the Sinks. The motorcyclist was traveling west along Little River Road at a high rate of speed when he lost control of his motorcycle and struck a 13-year old girl who was standing near a parked vehicle at the pulloff. He abandoned his wrecked motorcycle and fled the scene. The injured girl was flown by Lifestar to UT Medical Center. Investigators are looking for information from anyone who may have witnessed the incident or observed the two motorcycles traveling from Gatlinburg, TN towards Townsend, TN on Little River Road between 7:45 p.m. and 8:30 p.m. Additionally, any witness to the accident scene who took photographs or video of the scene is requested to contact the investigators through the tip line.